The Lower Mekong harbors a rich diversity of amphibian and reptile, most of which are found only in the region. Amphibians and reptiles play essential roles in intact ecosystems, serving as predators and prey. However, very little is known on the biology of most species of amphibians and reptiles in the region, and many new species of amphibians and reptiles continue to be discovered. Many of these species are considered to be threatened with extinction because of rapid deforestation and overharvesting for food, traditional medicine, and the international pet trade. Information on which species occur where, and their basic biology, is needed so that these species can be effectively conserved. Ms. Seateun and the team being trained by Dr. Karraker on the turtle ecology at the Sakaerat Environmental Research Station (Photo courtesy Dr. Aowphol). 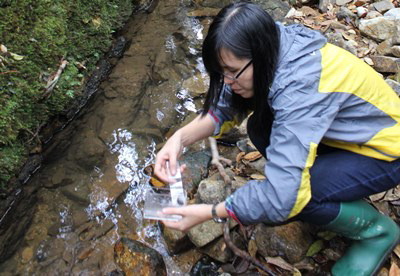 Le Thi Thuy Duong testing water in a stream (Photo courtesy Dr. Aowphol). This project proposes to address the lack of knowledge on amphibians and reptiles in the Lower Mekong by supporting the research programs of nine female scientists who study amphibians and reptiles (herpetologists) at three universities in Thailand, Laos, and Vietnam. The project will also help by creating a research network among the participants and their institutions through field research exchanges among these countries and a study tour on amphibian and reptile biodiversity research in the United States. A group photo of the team at Cat Tien Park (Photo courtesy of Dr. Aowphol). The PEER program provided opportunities for four female students to study herpetology and conservation. Dr. Somphouthone Phimmachak finished her PhD in zoology at Kasetsart University (Bangkok) and began her career as a lecturer at the National University of Laos, where she continues research on herpetology and conservation. She is the first Laotian herpetologist to complete a PhD. Ms. Korkhwan Termprayoon finished her MSc degree in zoology and continues her studies in the PhD program at Kasetsart, where she is conducting research on gecko systematics and conservation. PhD student Ms. Sengvilay Seateun is the second female herpetologist from Laos, and she will continue her career as a lecturer at National University of Laos. She has received additional support for her research from the World Wildlife Fund (WWF). Ms. Siriporn Yodthong is a Thai PhD student who focuses on amphibians on islands. 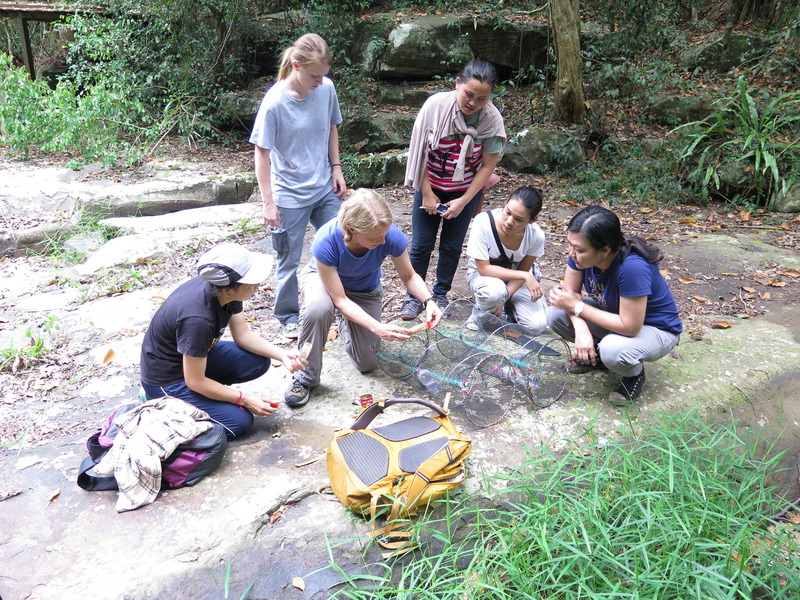 Her ongoing research will provide knowledge on genetic relationships and conservation of amphibians in Thailand. The PEER project has provided the support for building research collaboration among Southeast Asian researchers, and the four students in PI Dr. Anchalee Aowphol’s lab had opportunities to visit Vietnam, Laos, and the United States as part of the effort. As of the time the project ended in September 2017, member of the PEER team (including those based in Thailand, Laos, and Vietnam, plus U.S. partners) have published 9 peer-reviewed journal articles and one proceedings and made 21 technical presentations, providing and disseminating knowledge that can be used for conservation applications in collaboration with government agencies. Led by co-PI Dr. Hoang Duc Huy, the team members in Vietnam gathered and analyzed baseline information for amphibian biology and ecology in Bidoup-Nui Ba National Park, including a list of amphibian species in the park, the first description of the tadpoles of Leptobrachium leucops living there, and a description of the dietary patterns of ten local amphibian species, including the tadpoles of L. pullum and L. leucops. Their research provided information for amphibian conservation in the area, including on changes in amphibian species diversity and abundance, effects of habitat disturbance and other environmental variables, and evidence that the chytrid fungus has not significantly impacted amphibian populations in the region. On the education side, the PEER funds supported the work of two undergraduate students and one PhD student. The PEER support allowed the Laotian team to take part in international collaborative fieldwork both in Laos and abroad and to participate in the 5th Conference on Taxonomy and Systematics in Thailand at Kasetsart University. A study visit to the United States in June 2017 allowed participants to compare their specimens collected in Laos with samples in the collections of the North Carolina Museum of Natural Sciences and the Field Museum, and they also gained experience by taking part in a field survey of salamanders in North Carolina along with their Southeast Asian and U.S. counterparts. The visitors’ expertise facilitated the redescription of some Laotian amphibian and reptile species samples that had previously been deposited in the Field Museum. Thanks to follow-on funding received from the WWF, the Kasetsart University Research and Development Institute, the Center of Excellence in Biodiversity (Thailand), and Vietnam National University, the various participants in this PEER project are continuing their research efforts and their collaboration with their U.S. partner Dr. Bryan Stuart. In addition, the Bidoup-Nui Ba National Park has expressed interest in applying the research results in their ecotourism education program and in future decisions on areas that should receive priority protection for the conservation of amphibian biodiversity.